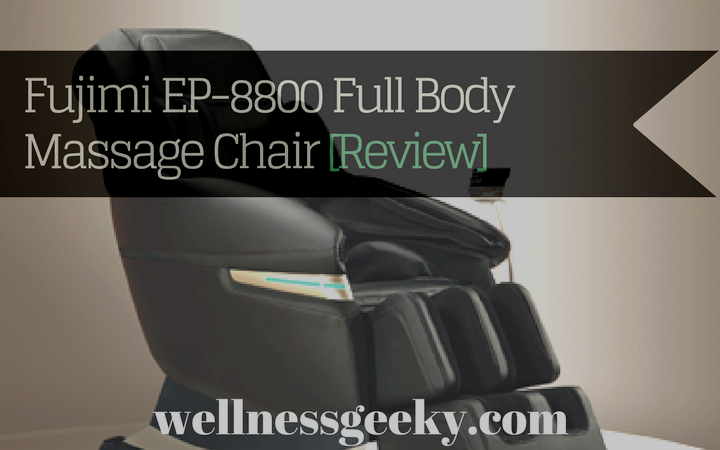 If you're looking for a high-end, quality massage chair, the Fujimi EP8800 is most likely on your list. While it contains some of the features you would expect for a premium chair, there are a few alternative brands and models that stack up better in terms of features, craftsmanship, and engineering. Because the EP-8800 contains so many features, in this review I'll just call out those that are unique and worthy of noting. Additionally, I'll highlight the benefits most users rate positively, as well as the missing features you'd expect in a chair in this price range, and a few preferred alternatives. If you're looking for a full-body massage, you'll get find it here. 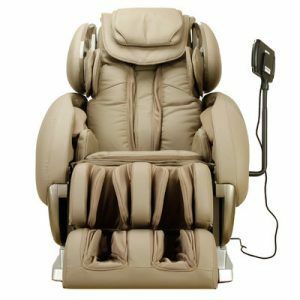 The EP8800 has fifty-three airbags in total, and foot rollers as well as scraping, which is common in the Thai and some Chinese styles of massage therapy. It also comes equipped with heat as well as magnetic therapy. 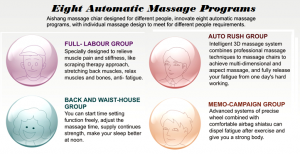 As far as built-in automatic programs, you can choose from eight different options. 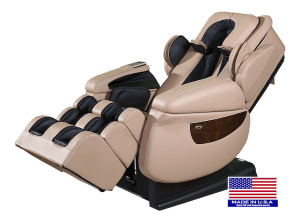 Most chairs these days come with built-in programs, but those in the 8800 are designed in a way that is more customized to relieve or refresh either a type of person, or are based on a state of body or mind. For example, the "Rush" program is for intense and fast relief, which would be good after, say, a long day at the office or travelling. The "Labor" program tailors to those who are on their feet or using their body all day; and "student" is designed to relieve the aches and pains that come from long hours spent studying. A nice thing about the the airbags in the EP-8800 is that they are customizable. You can raise or lower the intensity for all of them (53 in total) to suit your liking. Some find compression massage too intense, and most units don't allow for adjustments in the level of intensity. It also contains airbags in the arms, legs, and feet, as well as seat and back. There are two independent pumps for the airbags, so you can use and adjust them in concert or on their own, and you get a full wrap around the legs, ankles, and feet. Heat is a beneficial accompaniment to roller or compression massage, as it loosens tight muscles, increases circulation, and improves blood flow. In addition to heat, the EP8800 adds magnetic therapy, which is a unique feature that has been shown to reduce inflammation and reduce pain. It has eight magnets in the calf region, powered at 300cc. The 3D rollers simulate the action of human hands, grabbing, squeezing, kneading, and rubbing your muscles. The way the rollers are able to move in and out as well as up and down and back and forth allows them to manipulate and move deeply into muscle tissue very well, as opposed to just gliding over the top of the skin. This can aid in reducing knots and loosening overly tight muscles, especially behind the shoulder blades in the trapezius muscles. 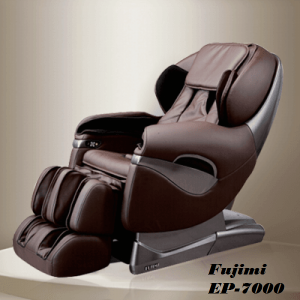 The EP-8800 performs scraping massage for the soles of the feet, which relieves pain and tension. It's also good for relaxation and has been proven to improve balance in people who suffer from Diabetes. Thorough upper body massage, including shoulders and arms. Advanced “hand-like” 3D massage rollers. Heat as well as magnetic therapy in the calf region. Stretch function at the waist. Full body air bag compression massage. No speakers or device plug-in capability for music. It’s hard to assemble, though the manual does provide pictures and instructions. Or, you can watch a video below. Quite heavy (weights almost 300 pounds). Expensive considering the features it doesn’t have. This is a high-end chair, and you pay for what you get, so you’d expect to see a more thorough set. You only get a one-year warranty. There’s only one zero gravity position. If music is a deal breaker, you might consider the Fujimi EP-9000. This luxury model brings with it everything you get in the EP8800, plus 3D digital surround sound and purified air. The negative ion generator is near the face, located at the shoulders, and it pumps out purified air as you relax. This is also a space-saving model, so you don't need very much room between the chair and the wall. If you're outfitting a small space or apartment, the Fujimi EP-7000 is noteworthy. 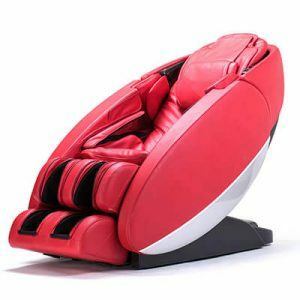 It also has a space-saving reclining track, so you can place it very close to a wall. It has a very long L-track (53 inches), so you get the extended full-body massage from the base of your skull, all the way down your back and glutes, to your hamstrings. It has a USB slot, so you can use and charge your devices. 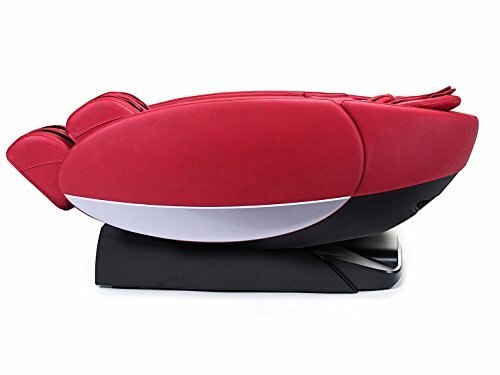 On the other end of the spectrum, the Fujimi EX-303 massage pillow is a low-maintenance way to get your massage on the go. This little pillow is versatile, designed to be used for your head, neck, lower back, or anywhere that you have pain or discomfort. It's compact and lightweight, making it good for travel, home, or the office. With all of this said, if you're going to be spending the money for a luxury model, in the same premium category price range, there are a few alternatives that have more features, are higher quality, and deliver on some of the gaps that are missing in the EP-8800. While Fujimi focuses on airbags and compression massage, it does leave out some. The Infinity IT-8500 is fully featured alternative. You get everything you'd expect, such as airbag compression in the arms, shoulders, and feet, as well as waist twist, spinal correction, and v-stretch. These are helpful if you are tight in the waist area or have tension in any of the places in your spine along the vertebra. It also features two levels of zero gravity, which is to be expected, and a premium sound system with built-in speakers. 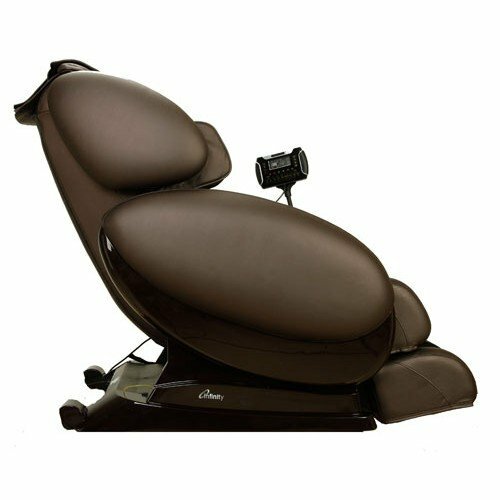 One of the best-selling chairs in the luxury category, the Luraco iRobotics 7 has a loyal customer base and gets repeatedly high marks. Some of the parts are made in Taiwain, but it is built in the United States and known for its high quality craftsmanship and reliability. It has over 100 airbags, so beats the Fujimi in this category. 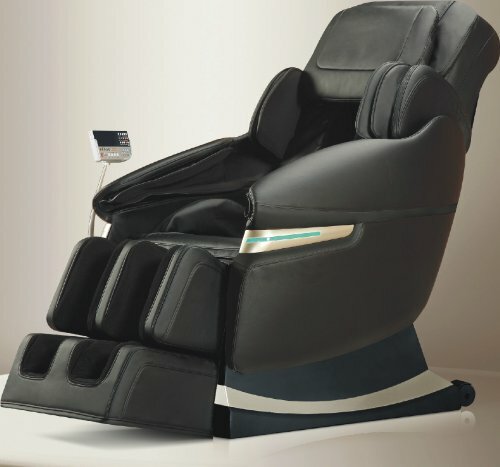 It utilizes body scanning technology so is better able to deliver a customized massage, tailored to your dimensions. The 3D rollers are also highly effective given their sophisticated design. It also has built in MP3 functionality for your device usage. Another standout in the luxury category, the Novo XT by Human Touch. While manufactured in China, some of the engineering and design does take place in the US. It has an L-track system and 3D rollers, but there are four balls on the roller track (known as quad rollers), which make for a more effective, human-like deep tissue massage because you adjust the depth, depending on how deep you want them to go. The design is modern, and it is one of the quietest chairs you can buy. The foot massage is variable, so you can adjust the speed of the rollers. It has air bags for compression massage in the feet as well, which are also adjustable. 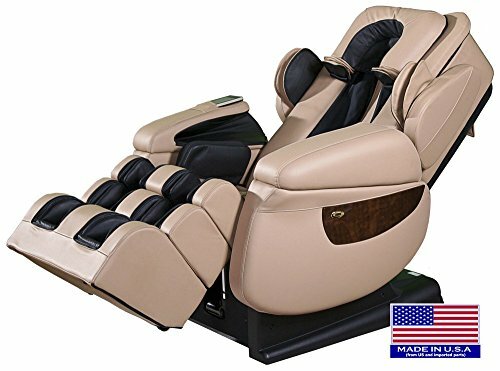 The arm massage is outstanding, and is one of the things the Novo XT is known for. The air bag covers have little rubber nodules on them, so they grab onto your arms during the compression, as the airbags fill sequentially. 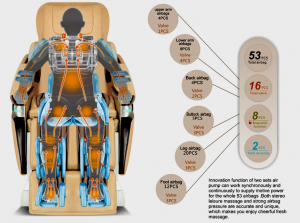 There is a body scan feature, but unlike most chairs that utilize it, instead of it scanning and adjusting accordingly, you use the readout on the remote, which highlights with numbers corresponding to the different parts of your body, to make adjustments. This puts you in control of fine-tuning the target areas. 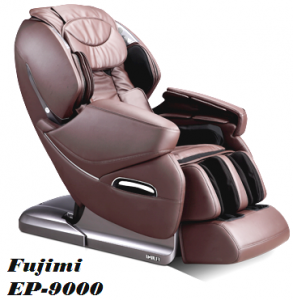 With its fairly long feature list, the Fujimi EP-8800 is a good massage chair, but it falls short when compared to some of the top models in the same category you can get on Amazon, like the Novo XT, Luraco i7, and Infinity IT-8500. It incorporates most of the latest in technology and engineering, but it lacks some basic functionality for the price tag.